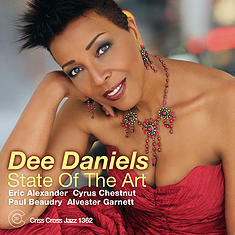 State Of The Art is not only singer Dee Daniels' debut leader date for Criss Cross, but the label's first-ever release by a vocalist after three decades and hundreds of recordings by jazz' best and brightest. It's a worthy addition -- the Seattle-born vocalist, who sang two numbers on Wycliffe Gordon's recent Criss Cross date The Intimate Ellington (Criss 1353 CD), brings her richly textured multi-octave voice, instrumentally-flexible phrasing, and keen interpretative abilities to a program comprising 12 gems from various corners of the American Songbook. Enhancing the swinging, soulful, old-master flavor and 21st century feel are tenor saxophonist Eric Alexander, who contributes apropos testifying solos and obligatos throughout, and a synchronously grooving rhythm section with pianist Cyrus Chestnut, bassist Paul Beaudry, and drummer Alvester Garnett.